Saturday night the Rochester Knighthawks forced a game deciding three in the NLL Finals by defeating the Saskatchewan Rush 13-8 in front of 9,174 screaming fans at Blue Cross Arena. The eight goals scored by the Rush was the lowest output since Calgary defeated them 14-7 on April 29, 2017. Robert Church and Jeff Shattler started the game rolling and it looked as if the Rush wanted to end the game early by seizing the momentum. Saskatchewan’s defense played strong in the first quarter with their sticks in every possible passing lane, limiting Rochester’s chances. Rochester would fight back with three straight, including Eric Fannell’s goal with under a minute to go. Ryan Keenan would tie the game at three with 3.2 seconds to go in the first quarter. This was closest the Rush would be the rest of the game. Josh Currier scored a career high four goals on the night and also chipped in with two assists. 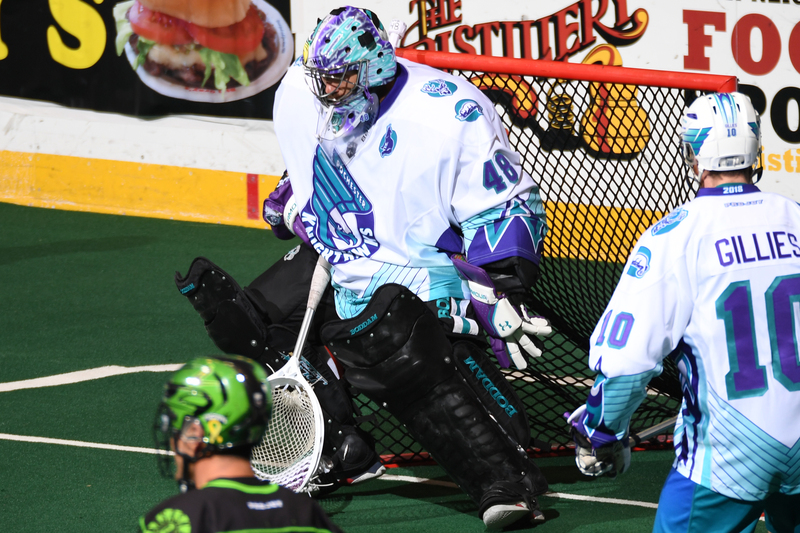 The Knighthawks’ defense kicked into high gear in quarter two as Matt Vinc would come up huge numerous times, limiting the Rush to only one goal while limiting the number of second chance opportunities. Rochester would score five times in the second quarter to back up Vinc’s performance in goal, and go into the half with an 8-4 lead and complete momentum. During the intermission, a coin flip was held between the Philadelphia Wings and the San Diego Seals to determine which expansion team would pick first in the expansion draft and entry draft. Patrick Merrill, the GM/head coach represented the Seals, while assistant GM Landon Miller represented the Wings. NLL commissioner Nick Sakiewicz flipped the coin and it landed in favour of San Diego. Merrill informed the commissioner they want to pick first in the September entry draft, meaning the Wings will have first choice in the July 16th expansion draft. Unprotected lists for the expansion draft will be released on June 11th for the teams to review. Saskatchewan would play six minutes shorthanded in the second quarter, and luckily for them the Knighthawks were unable convert on any of their power play chances, otherwise the score could have been even worse. Rochester outscored the Rush 2-1 for a 10-5 lead in the third while both teams played tight defense. In the fourth, the Rush answered every goal the Knighthawks scored, but couldn’t do any more than that as they tried in vain to close the five goal gap. Game 3 will be on Saturday, June 9th at 9:30 p.m. ET from Saskatchewan. Jeff Shattler (3G/4A) led the Rush’s offense. Josh Currier (4G/2A) led Rochester, while Graeme Hossack and Cody Jamieson would score two each to pace the Knighthawks’ attack. Jake Withers won 16 of 22 faceoffs.